In spite of volumes of information available on the importance of managing organizational change and aligning IT with the business, many companies are still experiencing a significant gap between the services IT provides and those that are needed by the business. 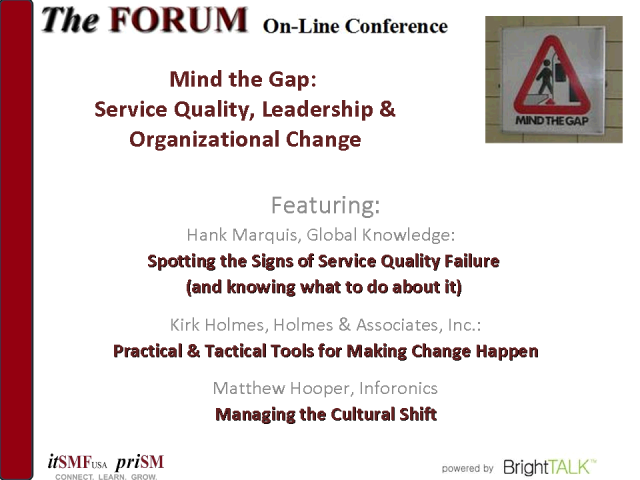 April’s On-Line Conference will look at another aspect of this important topic – the gap between service expectation vs. services delivered and their quality and how to establish a change management practice that brings the business and IT closer together. Industry leader Hank Marquis will kick off this event with his presentation “Spotting the Signs of Service Quality Failure: Sensing the Need for Organizational Change”. More program information will be available shortly.